Copyright ©2005 W3C ® (MIT, ERCIM, Keio), All Rights Reserved. W3C liability, trademark and document use rules apply. This document is an updated First Public Working Draft published by the Semantic Web Best Practices and Deployment Working Group, part of the W3C Semantic Web Activity. The Working Group intends the Quick Guide to Publishing a Thesaurus on the Semantic Web to become a W3C Working Group Note. This Quick Guide accompanies the SKOS Core Vocabulary Specification and SKOS Core Guide. We encourage public comments. Please send comments to public-esw-thes@w3.org [archive] and start the subject line of the message with "comment:". Change History: The initial (previous) version of this document was published with incorrect URIs in the UKAT examples. The URIs used in the previous version resolved to textual descriptions of UKAT concepts and were not intended to be the names of the concepts themselves. This last-minute publication change is corrected in this version. This document describes in brief how to express the content and structure of a thesaurus, and metadata about a thesaurus, in RDF. Using RDF allows your data to be linked to and/or merged with other RDF data by semantic web applications. In practice, this means that data sources can be distributed across the web in a decentralised way, but still be meaningfully composed and integrated by applications, often in novel and unanticipated ways. 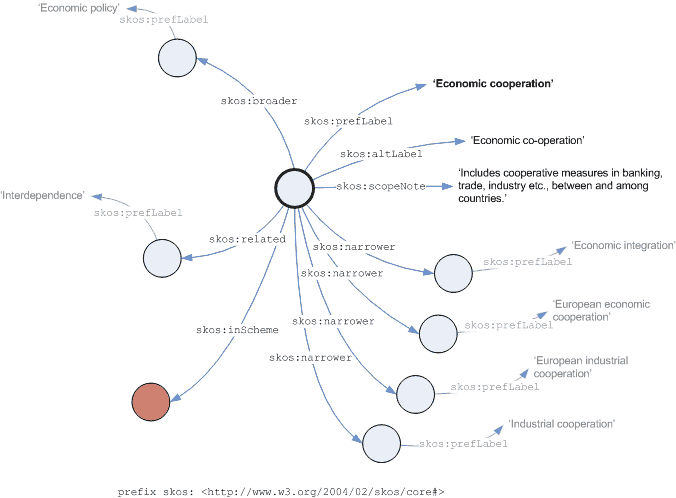 The examples in this guide are given as a visualisation of the RDF graph, e.g. An RDF graph can be serialised (i.e. encoded as a series of characters) according to any of three currently defined RDF syntaxes: RDF/XML [RDF Syntax], N3/Turtle [Turtle][N3], N-Triple [N-Triple]. All examples in this guide use the RDF/XML syntax for consistency. The examples in this document use the SKOS Core Vocabulary, which is a set of properties and classes that can be used to express the conceptual content of a thesaurus as an RDF graph. SKOS Core is designed to be used with not only thesauri, but also other types of 'concept scheme', such as classification schemes, subject heading systems, controlled vocabularies, glossaries, taxonomies etc. For a complete description of SKOS Core, see [SKOS Core Guide]. The examples in this document also use the DCMI Metadata Terms, which are properties and classes for describing resource metadata. For more about DCMI Terms, see [DCMI Terms]. Note that the prefix skos: in this document stands for http://www.w3.org/2004/02/skos/core# - so for example skos:prefLabel is an abbreviation of http://www.w3.org/2004/02/skos/core#prefLabel. Each of the blue circles in the image above represents a concept from the UKAT. The red circle represents the UKAT itself. Allocating URIs to the concepts in a thesaurus allows anybody to refer to them unambiguously from any context. For a complete description of considerations relevant to allocating URIs, see [WEBARCH]. See also the section 'HTTP URIs for Concepts' in [SKOS Core Guide]. Note that, in expressing the content of a thesaurus such as the UKAT in RDF using SKOS Core, each descriptor (preferred term) becomes a preferred label for a concept, and each non-descriptor (non-preferred term) becomes an alternative label for a concept. Note also the skos:inScheme property - this property may be used to assert a link between a concept and the concept scheme(s) in which it participates. SKOS Core places no restriction on the number of schemes in which a concept may participate. Most thesauri are managed via a thesaurus management system. Where the thesaurus management system stores its data in a relational database, or in an XML or structured text file format, or where the standard output of the thesaurus management system is an XML or structured text format, it is usually possible to create an RDF representation of the thesaurus via an automated procedure (e.g. database report, text parsing program, XSLT transformation). A full discussion of conversion techniques and best practice is beyond the scope of this document. However, note that when using an automated procedure, care must be taken to ensure that the output generated is sensible and conforms to the recommended usage of the SKOS Core Vocabulary. For example, if an XML format contains an XML element whose name is 'scopenote' it should not be automatically assumed that the textual content of these elements should be converted to the value of a skos:scopeNote property. Perhaps these 'scopenote' elements actually contain definitions, in which case the skos:definition property should be used; or perhaps the 'scopenote' elements have been used very loosely and contain all kinds of note types, in which case the more general skos:publicNote property would be more appropriate. Also note that maintaining an RDF representation of a thesaurus requires clear policies for versioning and change management. For example, users need to know if the meaning associated with a URI is stable, and if it isn't they need to know how and when it may change. A fuller discussion of management best practice is currently being undertaken by the Vocabulary Management Task Force of the Semantic Web Best Practices and Deployment Working Group. See [DCMI Terms] for a description of the recommended usage of these properties. ... denotes the UKAT itself. Note that SKOS Core models a thesaurus as a 'concept scheme'. For more about this, see the section 'Concept Schemes' in [SKOS Core Guide]. Note also that, in the example above, a link has been asserted between the UKAT thesaurus and the top concepts in the UKAT thesaurus (in the UKAT they are known as 'fields') using the skos:hasTopConcept property. Using this property is recommended, as it gives applications an efficient way of locating the top concepts for a given scheme. The simplest way to publish RDF data is to create one or more RDF documents containing your data, and publish them on the web via a normal HTTP server. Note that, although the examples above all use the RDF/XML serialisation syntax (i.e. file format), there are two other alternative syntaxes for RDF: N3/Turtle [N3][Turtle] and N-Triples [N-Triples]. For documents containg RDF data in the RDF/XML format, the 'content-type' field in the HTTP header for that document should be 'application/rdf+xml'. You can also publish your RDF data on the web via a dedicated RDF server such as Joseki [Joseki] or Sesame [Sesame]. Publishing via an RDF server allows anyone to query the thesaurus over the web via an RDF query language such as SPARQL [SPARQL]. Current practice suggests that if you use HTTP URIs as identifiers for your thesaurus and its concepts, then those URIs should dereference to an RDF description of the thing they identify.